St. John’s has been so hot, that the University has commemorated the week that was with a ‘Giant Slayers’ t-shirt. No really. What a terrific Valentine’s Day gift for Duke and Villanova fans. The Red Storm have evened their season with 13 wins and 13 losses. Your DePaul Blue Demons ruined Friar Alumni Day on Saturday by destroying the Providence Friars in their most impressive win of the year. As we are all acutely aware, the Blue Demons have not won a Conference Home game, while winning 3 on the road. According to kenpom.com, DePaul’s Home Court Advantage is 278th in the country (out of 351). This is the lowest home court advantage from a Power 6 school (Big East, Big 12, ACC, Big 10, SEC, Pac 10). Keep up the good work DePaul Fans! Another fun fact about the Demons, they have been extremely unlucky. It is not just a figment of your imagination, according to kenpom.com, DePaul has been the 329th most unlucky team. This implies that according to their point differentials and tight games, they should have expected to have a couple of more victories. The team on the opposite side of this metric is Xavier. Xavier is the 4th most lucky team this year, going 12-0 in games that were decided by 10 points or less. Wins and losses are decided by razor thin margins, and so are legacies. The Vegas line has the burning hot Red Storm favored by 2. Kenpom expects DePaul to win by 1. 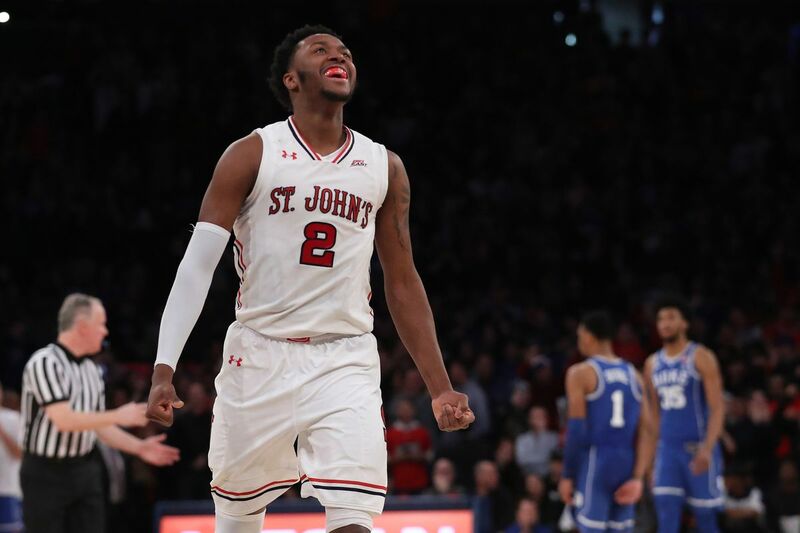 On January 6th, DePaul embarrassed St. John’s at Carnesecca Arena, 91-74. Marin Maric lead the way with 25 points, 11 rebounds and 5 assists, posting an Offensive Rating of 187 (100 is average). The Red Storm swept DePaul last year. Since the forming of the new Big East in 2014, these teams have split every year, with the exception of last year. This has been DePaul’s most competitive rival. 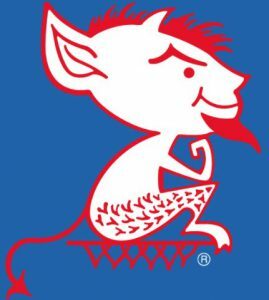 There are only 2 Vincentian Divison I teams (followers of St. Vincent DePaul’s missionary work), St. John’s and DePaul. These are truly sister colleges. St. John’s was founded before DePaul University. 9 of the Red Storm losses have been by less than 10 points. Similar to the Demons, the have kept most games close, but have failed to execute in the crucial last minute sequences of the game. That seemed to change with the Duke game, where Shamorie Ponds hit multiple clutch shots down the stretch. They have only been blown out 3 times this season, against Providence, DePaul, and Butler. St. John’s is an elite defensive team, 23rd most efficient. They pressure their opponents into turnovers. The cause the 9th most turnovers per possession in D1. They block a ton of shots, funneling players into their waiting Center, Tariq Owens, who blocks at the 8th highest rate in the country. As a team they are 4th highest in block percentage. They also steal the ball at the 3rd highest rate in the country. Their offensive is more in line with how the DePaul offense functions. The Red Storm does not turn the ball over (28th out of 351), does not have a lot of steals from them (16th out of 351) , and they do not get blocked (22nd out of 351). They do shoot free-throws well. However, they are below average at shooting from 3pt land (259th) and from the rest of the field (239th). Who Should Scare the Blue out of Us? Shamorie Ponds, hands down. Four consecutive game MVP designations. In a close loss to Xavier, Ponds put up 31 on 12-20 shooting. Live Shot of Ponds after He eviscerated Duke. Against, Duke he went for 33. Then he went for a measily 26 points in his ‘worst’ game against Villanova; another win. Finally, he went off on Marquette, making 44 points on 16-23 shooting, including 4 three pointers. He has been turning the ball over quite frequently, including 8 against the Golden Eagles, but his scoring has been off the hook. He is now 22nd in the country in possession usage. He takes a third of all Red Storm shots, and he shoots 83.8% from the free throw line. Who is going to guard this guy? On the Year, Ponds was a 25% 3 point shooter, but has shot 50% over the past 3 games. This has been the difference. Recent trends: St. John’s have made at least 40% of their 3 point shots over the past 3 games. The Red Storm have had of 3 of their highest effective FG% in the same stretch. Three of their 4 best points per possessions games are the last 3 games. For the season, it has been their offense that has been lagging behind the defense. But in these last 3 games, it has been their offense, and Ponds specifically that has been the difference. The teams, 3pt%, 2pt%, Effective FG%, and Adjusted offense have all improved over this stretch. The last time that these 2 met, DePaul had their most efficient offensive game of Big East play. They had their highest Point Per Possession of the conference schedule. The big difference, is DePaul did not turn the ball over against the Red Storm, while they just gave the ball to the Friars in the closing minutes of that game. Advantage: These are 2 highly flawed offenses, St. John’s is slightly better in that they do not turn the ball over as much. St. John’s is an elite defensive team that either steals or blocks their opponents shots and create the 3rd highest rate of turnovers in the country. Their only weakness is 3 point prevention. The Red Storm is the worst in the conference giving opponents a 41.7% from the arc. Over the past 5 games, the trends show that they have prevented 3 pointers at a better rate (36%) and have been better in Effective FG%. There overall defense has been dramatically better over the past 5 games. For DePaul to be successful, they will need Marin Maric to play the skilled big man role again. He was the key to the last victory. He played inside and outside, which allowed for the other Demons to get to the rack. Additionally, DePaul shot an uncharacteristic 47.7% from three point land. If the Demons get good Eli and average Strus, plus shoot well from the arc, they should be able to overcome some of St. John’s defensive abilities. It would be nice to turn the Losetrust Arena into the Wintrust Arena on Valentine’s Day, especially since I am taking my wife and all. This game is a toss-up. However, I have two hopes. Red Storm, you have gotten too hot. Demon Nation is here to put you out. I hope the Demons don’t ruin my Valentine’s Day date with my Wife. That would be heart-breaking, or something.